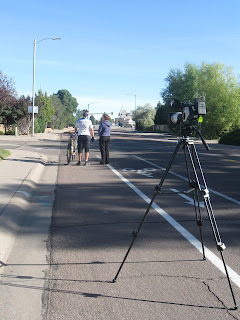 A few weeks ago, new bicycle lanes and sharrows were painted in the Belmont area near CSU-P. Today we shot some video of local bicycle volunteers using and misusing the new infrastructure features in attempt to educate both bicyclists and motorists on how to use them. 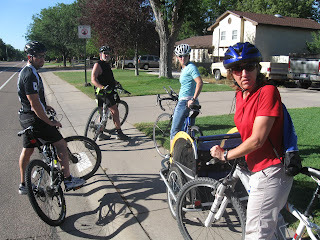 While we were shooting, we saw a variety of bicyclists using and misusing the sharrows, bicycle lanes, and sidewalks in the area, but were pleasantly surprised by the number of bicyclists we saw out. CSU-P is now connected to town by the Fountain Creek trail, bicycle lanes, bus, and sharrows. So hopefully the amount of single drivers at the university will start to diminish. If you haven't picked up your new Pueblo bicycle route map yet, here is a list of places around town where you can find them.